The original Chinese 5 Spice Pork Stir-fry recipe is correct so I just took some fresh photos to repost it now. I used a larger pork fillet so I was a little liberal when putting together the ingredients for the marinade and the result is the pork looks much darker this time around. I used to buy lasagne all the time but now that I’ve got a recipe I’m happy with I make it instead. And even though it’s not exactly health food, the homemade version has got to be more nutritious, right? So I decided to try to make a homemade version of another treat food – Chinese takeaway. I haven’t got a takeaway for quite some time because my normal order is Chicken Kung Po and I don’t eat chicken anymore. This isn’t like a Kung Po sauce at all but it does have nice mix of flavours and a good salty sweet taste. I continued making the lasagnes but I’m afraid after posting this it occurred to me to just start ordering Kung Po Pork instead – which is what I do. I used to make the terrible stir-frys. The worst thing about them was that they often smelled great making it even more disappointing that it just tasted wrong. I would either have burnt raw vegetables (bad combination) or limp over-cooked vegetables (I often used frozen veg – never use frozen veg in a stir fry), and if I was thickening the sauce with flour I usually hadn’t cooked the flour through before adding the sauce (very important because otherwise you’ll get a raw flour taste that you won’t be able to cover). Yeah they were very bad stir-frys. It was only when I read a recipe for something that instructed you to cook the veg right first, put aside, and add back in that I found a way to cook the veg right. 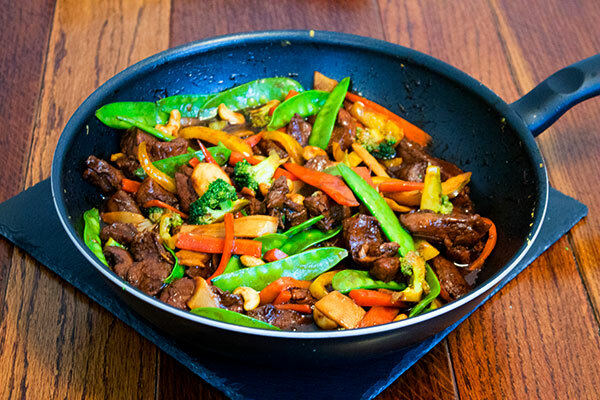 So if you too find it difficult to get the veg right in a stir-fry the method below is pretty much fool-proof. Mix the marinade ingredients together in bowl. Mix in the sliced pork and stir around well so that every strip is covered in the sauce. Cover and leave for 30 minutes. In a large frying pan or wok, dry fry/roast the cashew nuts. When just a little golden, remove from the heat and leave aside for later. It's a good idea to have all the veg chopped and ready for cooking before you start so that you don't overcook anything. Heat a little sunflower oil in the pan, add half the ginger and garlic. Keep stirring and don't let them burn. Turn the heat up high. Throw in the broccoli, mangetout, pepper and carrot. Again keep stirring to avoid burning. Sauté the veg for about 5 minutes - they should be a little softened but still have a little bite. Remove from the heat and put aside for later. Mix all the sauce ingredients together in a jug. Heat a little oil in the frying pan on a high heat. Add in the marinated pork. Cook for 2 minutes stirring around every so often. Add in the rest of the garlic and ginger and let cook for another minute. Next pour in the sauce from the jug. Cook until the sauce has thickened. The rest of ingredients will add moisture when added to the pan so be sure the sauce really has thickened first. Add in the bamboo shoots and water chestnuts, and stir around for another minute. Next add back in the veg and nuts. Finally stir in the spring onions and remove from the heat. Taste and sprinkle in some salt if necessary. Colourful with a little bite. Some Chinese 5 Spice Pork Stir-fry with boiled rice.